First of all forgive me for my english, I'll try to be as clear as possible. I got back to mini painting after some years of rest. I always do. I paint for a year then stop for three or more then go back to paint... I think is ispiration and my muse that often falls asleep. Anyway... when you start painting after many years you are always afraid you lost all the techiques and color management... luckly is not so, as soon as you start painting everything comes back and you go on learning and improving from where you left.Where I left was NMM. My last 3 models of some years ago where my first attemps at NMM. So I decided to continue learning this skill. I first tried with steel and had no issues with it (I'll write another article for steel), the real challanges were gold and bronze wich I never tryed. I tryed some gold but I'm still not really satisfied with it so I decided to master NMM bronze first. 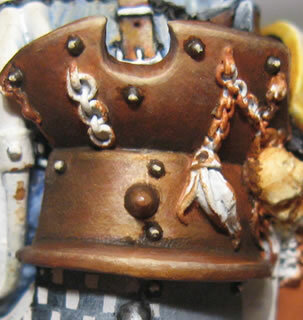 It seems it's one of the most difficult NMM effects to obtain because colors are not immediatly intuitive. They seem to range from brown to orange, from pink to yellow and even green. A big mess. Anyway to assure you that it's not worthless to keep reading this article, here is the final result I obtained. I have to say I'm really really satisfied with the result. Too bad I'm not a good photographer but this pic is very close to the original, even if the live version is much better as always.I don't want to keep this article long, so I'll go straight to the point. FIRST SHADING: (GW) 10 BASECOAT + 2 ORC FLESH WASH + 1 BROWN WASH + 1/2 BLACK WASH I use washes here because they keep the final result a bit glossy (just a bit more than glazing with acrylics does without a matte medium) and I like it on NMM. If you want you can use regular acrylics instead of inks. You should obtain a dark golden/green brown. 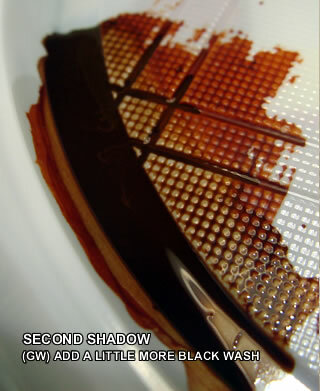 SECOND SHADING: (GW) ADD 1 BLACK WASH TO THE PREVIOUS MIX You should obtain a very dark brown, almost black (always golden somehow if you try it very watery on a towel). 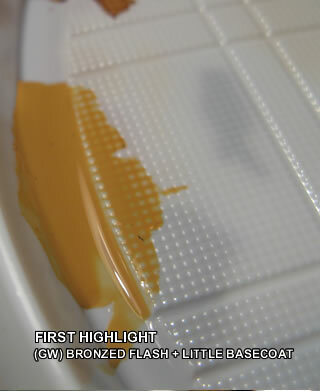 FIRST HIGHLIGHT: (GW) 10 BRONZED FLESH + 2 BASECOAT(VL) 10 BRONZE FLESHTONE + 2 BASECOATThis should look like an orange/golden pink/brown........ the image here below is a bit faked with colors, the real color is a bit more "pinkish". 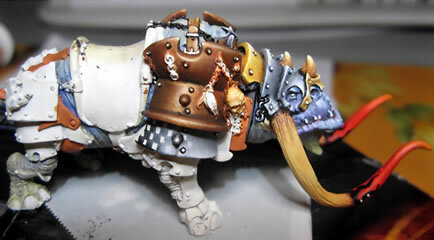 I usually use GW colors and give a skull white primer on the model because a white coat tends to give more brillant colors to the final model (expecially if you glaze the whole model) and I like the "cartoonish finish" Rackham (and old GW) style.I achieved the bronze effect you saw at the start of this article with only 5 steps.STEP 1 (BASECOAT)(GW) 10 BESTIAL BROWN + 3 BLAZING ORANGE + 1 BLEACHED BONE (VL) 10 BEASTY BROWN + 3 HOT ORANGE + 1 BONEWHITEUse the basecoat color mix to get an even surface. When dried if you got the right mix it should look more like an "earthenware jar" or "pottery" than bronze. It's a reddish brown. If it looks like this the color is ok. I put very big pictures so you can see well everything. The white chains on the plate are still work in progress of course and I'll paint then whole black and then with NMM steel. I'll paint them whole black before to get the outlining effect.Anywya let's go to step 2.STEP 2 (FIRST SHADING)(GW) 10 BASECOAT + 2 ORC FLESH WASH + 1 BROWN WASH + 1/2 BLACK WASH Use the color mix described above for the first shading. First of all, if you want to fake a real metal, you should understand where the shadows and the highlight should be painted. There are several tutorials and references on this sites for this as well. 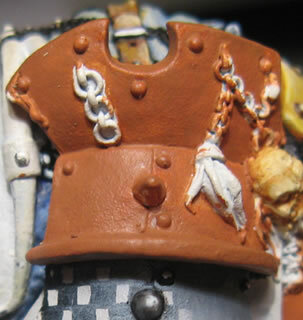 A simple and fast method would be to see it before applying the white primer coat to the model.Put it in direct light and take a shot (or just watch how and where the shadows and highlights are arranged) and then reproduce them with painting.In this particulare case, there are 2 pieces of plate with different bendings. The lower one I start shading from the center to the edges (2 shading). I'll try to shade mode the upper and then to have less shading on the lower part.When shading keep the glaze very very watery at first. At start it will seem you are not painting at all (but you are...). Then the color palette will start to dry a bit and your shades will start to appear.Try to shade keeping the parts you want to highlight out of it or just give them very few passes. In general after shading you should look at the result and think it won't need highlighting at all. This means you did a good job.The real trick in glazing (and shading with glazes) is that you start painting the whole area, going with the brush toward the darkest one in this case and then you repeat the process always in smaller areas. 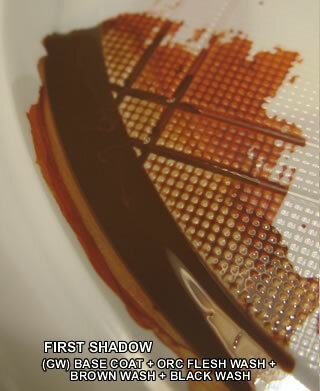 So to make an example, consider "D" is for dark and "L" is for light, You would do something like this <----------- L (paint, giving more and more passes as you notice a change in color)D <-------- L (the area you paint is smaller and always toward dark, go on glazing)D <---- L (smaller again... and so on...)For highlighting just invert the process, painting toward the lighter side but always withi this technique.STEP 3 (SECOND SHADING)(GW) ADD 1 BLACK WASH TO THE PREVIOUS MIX Add a bit more black to the mix and glaze in the recess and darkest areas. Again keep it very watery so you have more control. Remember to leave sharp edges and spots that should look very bright (highlighted).If you did a good job with this two steps of shading, the result should look like this. STEP 6 (CORRECTING ERRORS)(GW) 10 BESTIAL BROWN + 3 BLAZING ORANGE + 1 BLEACHED BONE (VL) 10 BEASTY BROWN + 3 HOT ORANGE + 1 BONEWHITEIf you feel there are some "rough" transitions, just have a very very very watery mix of the original basecoat, dry well the brush before applying and do an overall glaze (starting from the lighter zones and going toward the darker ones).This will eventually smooth up any rough passage or to dampen any "too bright" zones.Usually if you did everything well you could skip this phase.THE RIVETSNo mistery here, just use a dark brown (almost black) and paint the rivets. Then highlight with bleached bone. 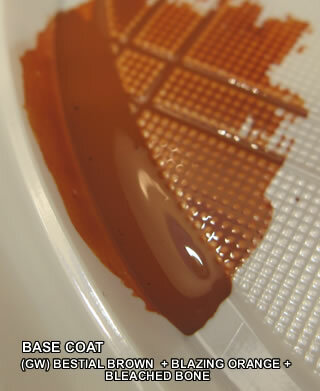 Since everything is very mix based and glazing based you may obtain different kinds of bronze. 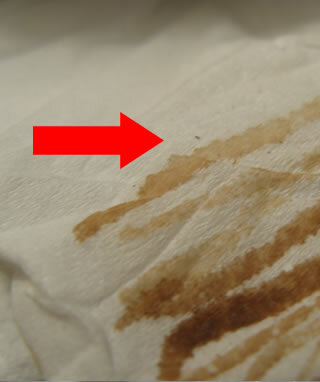 You colud have a more reddish (copper-like) bronze or a more golden like bronze. 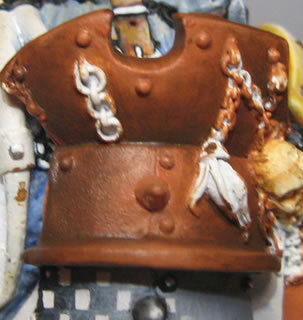 Just experiment and you will love how NMM bronze looks on your models. Here are a couple of slightly different bronze effects. The one on the left is more dark and golden, the one on the right is a bit lighter and reddish (more copper like).